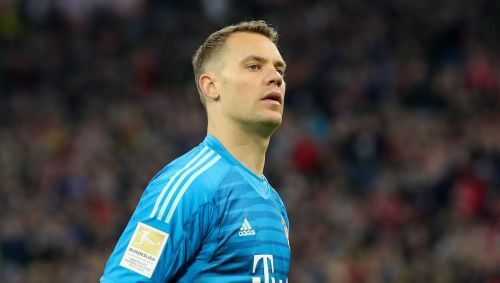 Manuel Neuer will miss around two weeks after reinjuring his calf in Bayern Munich's win at Fortuna Dusseldorf, the club have confirmed. The same problem kept Bayern's captain out of recent matches against Freiburg and Heidenheim and he is now in doubt for at least two of the club's final five Bundesliga fixtures. Niko Kovac's men, a point clear at the top, host Werder Bremen and visit Nurnberg in the next fortnight, with a DFB-Pokal encounter against Werder in between. Mats Hummels is also under a fitness cloud after straining his thigh in the late stages of Sunday's 4-1 success. Bayern announced the centre-back will take a "short break from training" as they seek to stay on track for a seventh straight title. Kingsley Coman's double and one apiece from Serge Gnabry and Leon Goretzka earlier lifted the champions to a convincing away win. Head coach Kovac commended his team's conviction in building on last weekend's 5-0 thumping of second-placed Borussia Dortmund. "We were serious over 90 minutes, we didn't allow many chances, it was the right margin of victory," he said. "The team did a very good job. We're Bundesliga leaders again, and we don't want to give it away."